SPLENDORA, Texas - When we met Cristian Beasley, 12, he was wearing a black Greenleaf Elementary School T-shirt and rolling down the hallway with his sixth-grade classmates from one room to another. Rolling, literally. 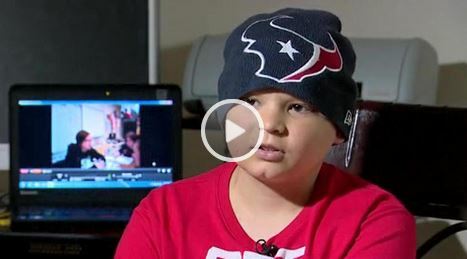 Cristian has acute lymphoblastic leukemia. He is at a critical point in his chemotherapy regimen, and a compromised immune system makes an elementary school off limits. But Kip Robins with the Region VI Education Service Center heard about Cristian and knew he had an available solution. VGo Communications markets “telepresence” robots that can be operated remotely via computer, wifi, and the Internet. 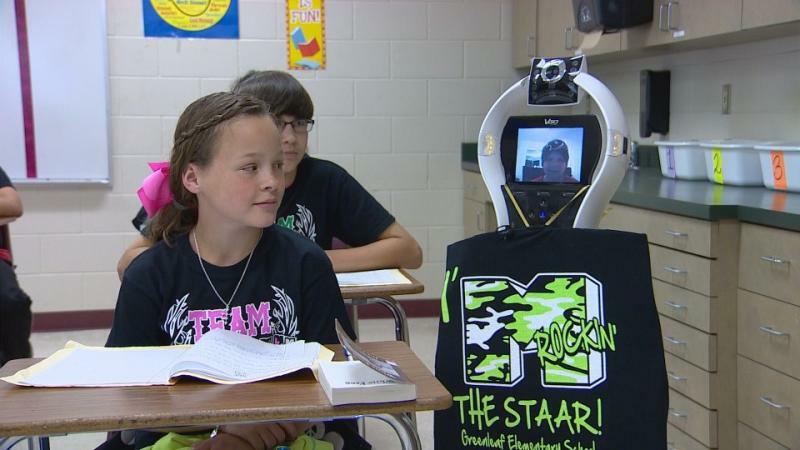 Children can drive the robot remotely, see and hear their teachers and fellow students with a remote web cam. A video screen at the top of the robot allows the student to be seen and heard in their own classroom. VGo has dozens of the units operating in schools across the country for students who are too ill or too disabled to attend school in person. Cristian would be the next. “These homebound students deserve the opportunity to go to school,” said Robins, who helps coordinate the state-funded program. “And even though you might want to be at school for real, it still is cool,” said Cristian. And what educators have found really cool is how the other students have responded. In a recent fire drill at the Splendora School, his fellow students insisted the robot not be left behind. A teacher grabbed “Cristian” and brought him outside to safety with the rest of his classmates. “It feels just like he’s really here, like it used to be,” said one of his best friends Colby Seale. “I’m happy because he’s back in our class, and we missed him a lot when he wasn’t,” said classmate Sydney Theriot. “Every case has been positive. 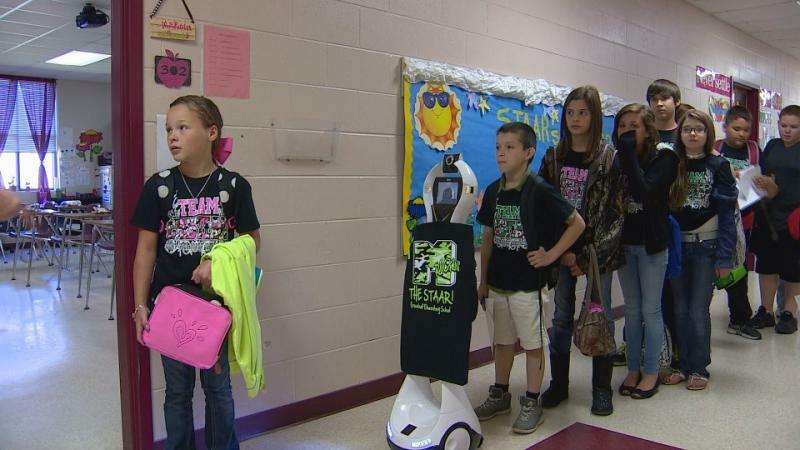 These kids are my heroes,” said Robins, who helps coordinate four of the VGo robots at different schools in Region VI. Principal Adriana Velasco said the only proof she needed that the program would work was the first day “robot” Cristian arrived at Greenleaf. Cristian has nicknamed his robot “Watt” after Houston Texans football star J.J. Watt. A meeting with his sports hero is in the works for later this month. However, Cristian’s mom Amy Gaskamp said the true hero is the technology program that has pulled her son out of his post-diagnosis depression, allowed him contact with his friends and enabled him to continue getting good grades. Students and staff at Greenleaf Elementary are sponsoring a benefit for Cristian and his family. The Curing Cristian Beasley One Step at a Time Fun Run/Walk is scheduled for May 18 at the Splendora High School track. The event will help pay medical expenses. Cristian’s chemotherapy regimen is expected to last at least three years although he hopes to be healthy enough to attend school in person next year.